Some of the highlights of being a part of this group include learning about the hundreds of charitable organizations in the local community, and the needs that they address. “It has been amazing to see how four meetings a year can have such a big impact on these charities,” Lisa says. 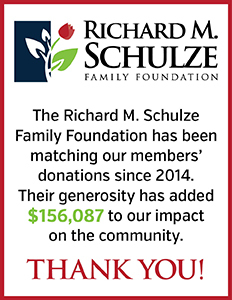 An article in the Star Tribune led to a partnership with the Richard M. Schulze Family Foundation and the development of a matching grant program. The matching donations from the Schulze Foundation have allowed these ladies to significantly increase the donations their group makes to the selected charities.